Visiting Yellowstone National Park can be both exciting and overwhelming. The iconic park contains more than 1,100 miles of hiking trails, which often makes it feel nearly impossible to narrow down your options to just a few. It’s always a great idea to stop by a visitor’s center when you arrive in Yellowstone, as the rangers can offer suggestions on which trails will suit your needs and experience level best. They may also have some information to share about which trails are the most crowded too, helping you to avoid lot of other hikers and get a little solitude in the backcountry as well. But if you can't wait until you're actually there, these are our picks for five unique hikes within the park that simply can't be beat. These trails will take you past waterfalls, hot springs, snowcapped mountains, wide open meadows, and crystal clear lakes, with the potential to spot some wildlife along the way. Don’t be deceived by this trail’s short, one-mile round-trip distance. With 328 stairs, the hike is a serious workout that offers more than 308-feet of vertical gain and loss along the way. The reward: an up-close-and-personal view of the Yellowstone River’s Lower Falls, one of the premiere natural attractions in the entire park. 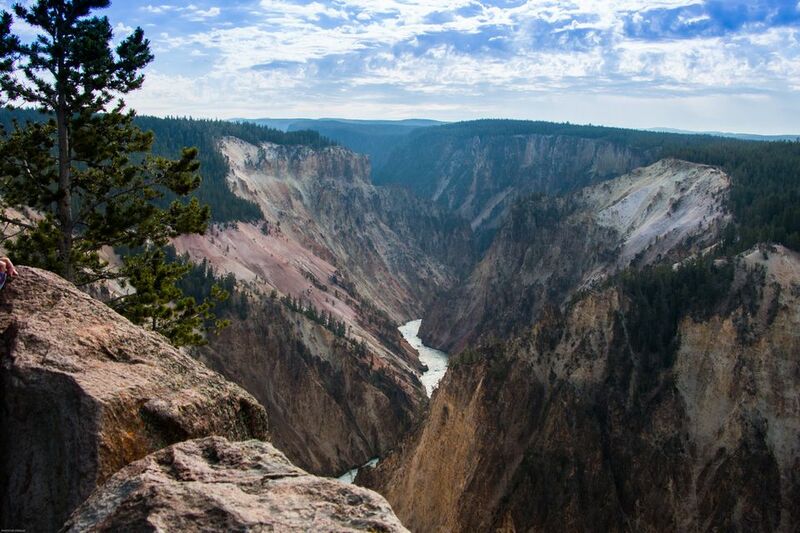 The trail first heads down into the park's most famous canyon: the Grand Canyon of the Yellowstone. Dizzyingly steep and often crowded, the stairs can present a bit of a mental challenge, although once you start down you'll find it isn't so tough. At the end is a viewing area located close to the bottom of the 308-foot waterfall. At that point there’s a good chance you will be shrouded in mist and walking amongst rainbows, making the experience all the more memorable. After you've caught your breath and spent some time enjoying the mystical canyon, start the long climb back up to the top. The current stairway, outfitted with handrails and benches for resting along the way, is a vast improvement over the original—a 528-step rope ladder that was first built in the 1800s. Still, be prepared to work a little on the crawl back out, and don't be afraid to stop and take a break along the way. This hike is not necessarily recognized or advertised by the National Park Service, but it’s definitely worth the effort for hikers looking for something truly special. The Grand Prismatic is a monster thermal feature with a tie-dye look that can be found in the southwestern region of Yellowstone. Various types of thermophiles—microorganisms that thrive in the intense heat—create vibrant rings of color in the pool, which is filled with bright orange, yellow, green, and blue hues. You could get a look at this stunning feature from a boardwalk at the Midway Geyser Basin, but it is much more impressive from a bird’s eye view. In order to catch a glimpse of Grand Prismatic in all of its glory, park at the Fairy Falls trailhead and hike about a half mile down the Fairy Falls trail. You will see a handful of unmarked spur trails leading up the hill on the left (south side) as you approach. Take any one of these up to the top of the hill and you'ill be looking down on this impressive display of nature's color palette. Just be sure to go on a warm day if you want the best possible views. When its cool outside the geyser is often hidden by its own rising steam. In the far northwestern corner of Yellowstone boiling water bubbles up from the geothermal features in the Earth, flowing into the nearby Gardner River. With minimal effort, you can reach one of Yellowstone’s most soothing spots. It’s a flat one-mile walk from the parking lot to this soak site, which serves as a natural hot tub for those looking to relax in the wild. Every year, people use rocks to create pools along the edge of the river, where visitors can take a luxurious soak outside of the current. If the river is not moving too quickly, the cool waters in the middle offer a reprieve from the hot pools. Use extreme caution if you venture away from the bank however, as the Gardner River can be deep and fast depending on the year and season. While you’re soaking, keep your eyes open for wildlife. Bald eagles routinely fly overhead and elk are known to cross the river from time to time too. Not heading north in Yellowstone? Check out the Firehole River in the southwest for a similar swimming experience at the opposite end of the park. Norris Geyser Basin is Yellowstone’s oldest thermal area, with geothermal features that date back more than 115,000 years. Here you will find the Steamboat Geyser, the tallest active geyser in the world. It’s no Old Faithful when it comes to putting on a regular show, but during a major eruption it has been know to eject water 300 to 400 feet in the air. That doesn't happen all that often however – the last major eruptions took place in 2005 and 2013– so don't expect to see one during your visit. Steamboat more typically shoots water 10-40 feet in the air on a regular basis. This geyser basin is made up of three areas: The Porcelain Basin, accessible by a three-quarter-mile dirt trail and boardwalk; Back Basin, which consists of a one-and-a-half-mile trail and boardwalk; and One Hundred Springs Plain, an off-trail area best visited with park staff who know these dangerous thermal features and how to avoid them. No matter how much or how little you choose to do here, you won't be able to escape the sights, sounds, and smells of Yellowstone bubbling out of the Earth. The Norris Geyser Basin is one of the more active geothermal hotspots in the area and of course the best way to experience it is on foot. If you are looking for a truly big adventure in Yellowstone, tackle The Thorofare. This trail spans 68.5 miles one-way through the southeast region of the park. It is so remote and wild that at one point backpackers are actually 30 miles from the closest road in any direction. You will have to leave a car at either end of the trail (one on the East Entrance Road and one on the South Entrance Road), and it is recommended that you give yourself at least seven days to hike from one trailhead to the other. You don’t have to trek the entire trail to get a taste of The Thorofare however. If you have less time, consider an out-and-back trek on this epic route. One of the best campsites in all of Yellowstone (5E8) is just 6.5 miles in and is located right on the shore of Yellowstone Lake, one of world’s largest freshwater bodies of water. Campers can relax, take a chilly dip, and enjoy the views after a long day of hiking, making this the perfect destination for an overnight or weekend excursion. Whether you are going out for one night or seven nights on the Thorofare—or anywhere else in Yellowstone for that matter—take the time to plan carefully. With the proper preparations, the backcountry can be one of the most unique and rewarding ways to see the park. Cece Wildeman worked at Yellowstone National Park for two summers. During that time she explored 300 miles of the park's 1,100 miles of trails.